This high energy event was held at the Angel Valley Retreat Center in heart of a vortex in Sedona, Arizona. Bashar begins this exciting day with a discussion of the "Neutral Zone", an area of your brain that allows for connecting with the higher mind. He explains how to activate certain centers of the brain to accelerate the transformation process and gives a hint of the powerful process we will experience in the second part of the day with the Holotope. Q&A: Creating a new spiritual facility in Sedona. What are Bashar's thoughts on binaural beats and audio technology for use in meditation. What are "permission slips"? 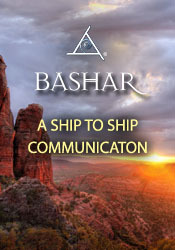 What is the purpose of Bashar's ship being positioned over Sedona? The experience of having your world crumble. A discussion about the hybrid children. By what criteria were humans selected for participation in the hybridization program? What is Bashar's view of ascension? What can we do to prepare the "crystal children" currently on Earth. Bashar shares with us a story about a child in his society and how they taught that child. How can someone instantaneously manifest something? The Earth concept of utopia. Why do phobias deplete your energy? Questions about chem trails, Swine flu and the predicted compulsory vaccinations. How Bashar relates to fear based questions and belief systems. Using the labyrinth at Angel Valley Resort and its suitability as a landing location for Bashar's craft. Can humans have intimate relationships with extraterrestrials. What forms of relationship can humans have with aliens? Acting on your excitement and the fear that the universe will not support you in that. Removing fear. Teleportation. Receiving help with getting downloads for a book on quantum physics.